PMI has represented Kikkoman since 1985, when we first started out as a retail broker. This was followed by us taking on the role as the retail and industrial broker, through their subsidiary Japan Food Canada. In 2008, Kikkoman decided to work directly through us, servicing industrial and foodservice distribution in Eastern Canada. Two years later we also took on the industrial distribution for Western Canada, and in 2015 we were awarded the foodservice distribution for Western Canada. This made PMI the National Distributor for Kikkoman Industrial and Foodservice products, servicing both channels via our three distribution centers – located in Ontario, Alberta, and British Columbia. Kikkoman was first formed when eight family soy sauce companies officially merged their businesses in 1917, forming Noda Shoyu Co., Ltd. Following significant development in Japan, Kikkoman soy sauce exports became an integral part of the business in 1949. Once the soy sauce business was well established in Japan, the sales extended across the ocean to San Francisco in 1957, followed by the first international plant built in Wisconsin in 1972. The success in the U.S. market resulted in Kikkoman expanding to Canada and internationally in 1980, with significant international growth occurring between then and 1998. At this time, Kikkoman Corporation was formed and is now recognized worldwide as a leader in soy sauce and Asian seasoning production. Currently, Kikkoman is the world’s largest soy sauce manufacturer and a leader in innovative soy sauces and flavour solutions, with three soy sauce plants in Japan and seven international ones, as well as a wealth of technical expertise and resources on-hand. Kikkoman is renowned for its naturally brewed soy sauce, made using the traditional Japanese process: honjozo. Kikkoman has the capacity to meet your order requirements, while also providing the latest information and trends in soy sauce and all-purpose seasoning processing, and the international market. The forgotten fifth flavour, umami is also known as “savoury”. Often associated with meat or protein products, due to the glutamic acid, umami is the main flavour in soy sauce. Thus, with its complex amino acid profile, soy sauce is an excellent replacement for MSG and other synthetic, chemical flavour enhancers. Processed foods benefit from small amounts of soy sauce, allowing for shorter production schedules and less time required to develop complex enhanced flavours. Soy sauce boosts and rounds out the flavour of these processed products, for example; chicken, beef, soups, sauces, dressings, and cured meats. 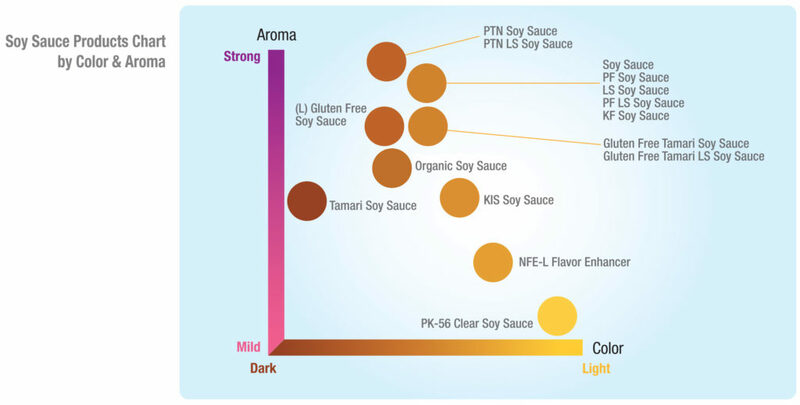 Kikkoman offers an extensive line of soy sauces, which are traditionally brewed via a fermentation process using salt, soybeans, enzymes and wheat. During the extended fermentation, enzymes denature the soybean protein for a well-rounded and full flavour. The enzymes also convert the wheat starches into sugars, which balance the saltiness of the final soy sauce product and produces ethanol, an aromatic ester that provides the typical soy sauce aroma. The alcohol and additional sugars contribute to acid development, rounding out the tartness while also acting as preservatives. Maillard browning reactions produce the reddish-brown colour, which must be protected along with the flavour by ensuring the finished soy sauce is not over-exposed to oxygen or extreme temperatures. Kikkoman offers a wide range of soy sauces to meet your needs, including: gluten-free, preservative-free and low sodium. If you are looking for the flavour enhancing benefits of soy sauce, but in a dry application, the powdered soy sauces are an excellent option. For your convenience, varieties include: low sodium, dehydrated, granulated, gluten free, and various intensities. The intended use is for dry mixes, soup bases, bouillon, sauces, dips, seasonings, and snack coatings. An innovative ingredient to meet clean label needs, while reducing sodium by 30% to 50%. Available in liquid or powder forms – depending on the application. NFE is intended to enhance flavours, compliment and boost the umami profile, and replace salt. Authentic teriyaki made with Kikkoman’s traditionally brewed soy sauce. A ready to use marinade for product formulations – available in the following variations: regular, dehydrated, preservative-free, and less sodium. Asian flavours and cuisine have experienced a significant increase in international popularity, due to consumer demand and market trends. In addition to soy sauce, Kikkoman also provides a wide range of the following Asian sauces and seasonings: Sriracha Hot Chili, Stir-Fry, Thai-Style Chili, Hoisin, Plum, Salted Mirin, Salted Sake and Sushi Vinegar.